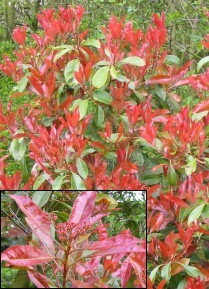 PHOTINIA RED ROBIN (Photinia fraseri Red Robin). Hedging Plants, Trees, Shrubs and Conifers. Bight red new leaves and flowers in spring. Spectacular evergreen with glossy, dark green, leathery leaves and new growth brilliant red giving a stunning display especially in the spring. The new growth turns to bronze by late spring then to green, but all new flushes of growth throughout the growing season are brilliant red. Clusters of small white flowers in spring. Any reasonable soil but not extremely alkaline. Protect plants from severe cold during first winters. HEDGE Trim in spring. For hedges 5-8ft (1.5-2.4m). Plant 2-3ft (60-90cm) apart.